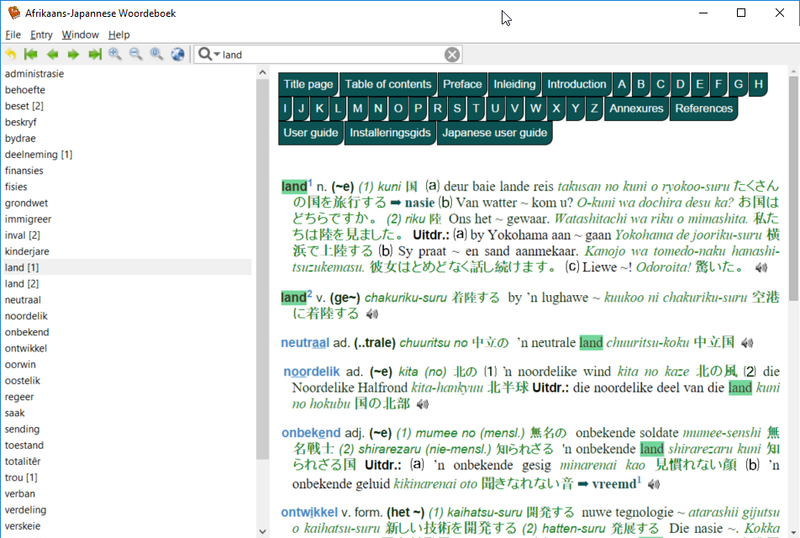 This is a software version of the Afrikaans - Japanese Dictionary by Prof Ernst F. Kotzé et al., and runs on Microsoft Windows. This rich, comprehensive work is the culmination of over two decades of work by Prof Kotzé, in collaboration with Prof Takashi Sakurai (a fluent speaker of Afrikaans), with additional work and support from Prof Hideo Sawada, Prof Shigeki Kaji ILCAA (Institute for the Study of the Languages and Cultures of Asia and Africa at the Tokyo University of Foreign Studies), Ms Ami Okabe, and more. "This book is meant for two major target groups: Firstly, for Japanese speaking users who have no knowledge of Afrikaans, but also for those who possess some knowledge of Afrikaans and have the need to extend their proficiency of the language; and secondly, for Afrikaans speaking users who either have no knowledge of Japanese, or with some basis in Japanese, and wish to extend their proficiency in the language. The function of a dictionary such as this is to transmit content from one’s own language to, and express it in, the source language (encoding), but also to unlock the meaning of words and sentences from the other language, and understand it clearly (decoding). For this purpose, both an Afrikaans-Japanese and a Japanese-Afrikaans component (which will be completed shortly) are necessary. With this first volume, direct encoding for speakers of Afrikaans, as well as decoding for speakers of Japanese, are made possible. However, already at this stage, indirect encoding and decoding by way of back-translation is a possibility." litnet: Afrikaans, Afrika en Japan: Afrikaans-Japannese woordeboek "My ervaring, deurdat ek ook betrokke was by die samestelling van ’n Afrikaans-Zulu-woordeboek, is dat tweetalige woordeboeke nie net tweerigtingkommunikasie tussen sprekers van die betrokke tale bevorder nie, maar ook belangstelling prikkel in die taal en kultuur van die sprekers wat van twee kante by so ’n woordeboek betrek word"
This dictionary is also available in print (hardcopy), and there is also an online version available as part of the Pharos Online Dictionaries offering.